Nadine Sutherland’s high energy dancing and powerhouse vocal style are sure to be just the right potion to rock the Philadelphia Caribbean Festival as she closes the show this coming Sunday (August 19th) at Penn’s Landing. 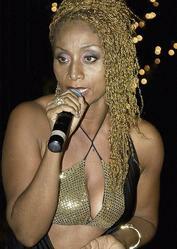 The reggae diva is looking forward to performing old favorites along with material from her new hit album, Call My Name. The festival takes place from noon to 8pm and admission is free of charge. Call My Name has spent more than 20 weeks on Billboard’s Reggae Album Chart and spawned three hit singles; “Keep Me Safe“, “Cyan Tek It“, and “Big Tings“. Her newest single “Remedy” was only serviced to radio last week and is already in heavy rotation at Florida’s Mystik Radio. The song has been a popular track since the album’s release, and response to the new single release mix has been immediate. Eight76 Records plans to shoot a video for the song with Nadine sometime in September.